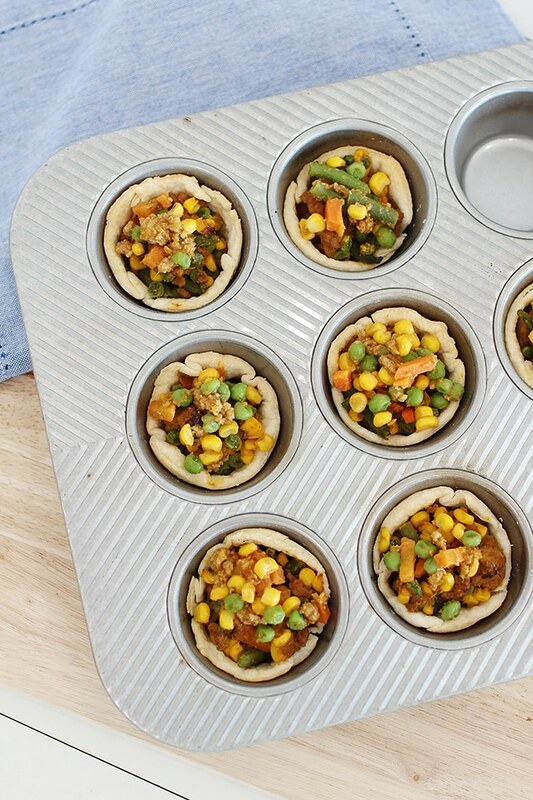 Take Thanksgiving leftovers to a whole new level with muffin tin mini pumpkin pot pies. They make the perfect brunch, lunch or even a late night snack. Once the Thanksgiving feast is over, you’re left with a little bit of this and a little bit of that. There isn’t enough for a full meal. Or is there? 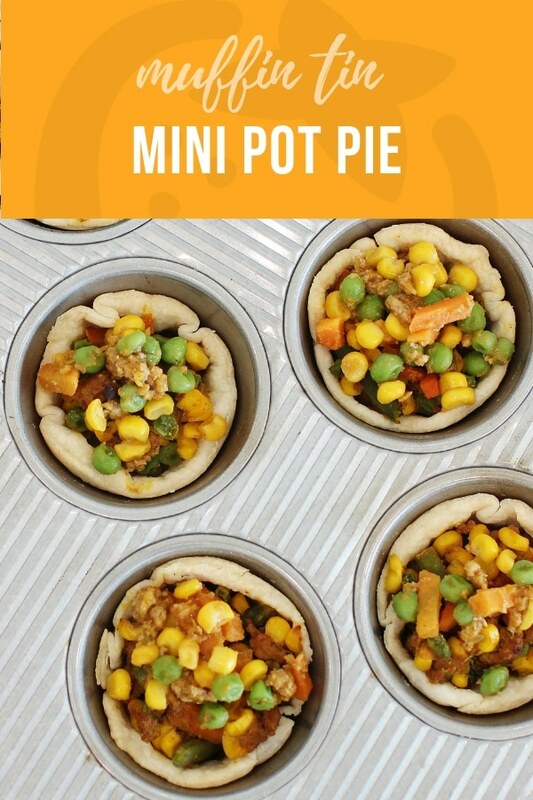 Combine those leftovers to create Muffin Tin Mini Pumpkin Pot Pies that the whole family will love. What kid doesn’t like pie for dinner?! It only takes a half cup of pumpkin (or squash) to create a fun post-Thanksgiving brunch or lunch. The pumpkin replaces the traditional pot pie cream sauce. Start with a simple premade pie crust . This is a great project for kids. They love to work with their hands and press the dough into the muffin cups. While the crust is baking prepare the filling. It only takes a few minutes of hands on time since everything is already cooked. You just have to warm it together. Want to serve this for a weeknight dinner but you don’t have Thanksgiving leftovers? No problem. Ground turkey or chicken work just as well as roasted turkey. Add frozen vegetables and you’ll still have a quick prep meal. Aside from the pumpkin the component that brings this whole dish together is rich, turkey broth. It is packed with vitamins and minerals. Simply debone your turkey and throw all of the bones, skin, etc. into a crockpot. You can add roughly chopped vegetables like carrots, celery and onions for flavor if you like. Season with salt and herbs. Fill the crockpot with water. Cook it on low for 12 – 24 hours. When you strain it you’ll have amazingly healthy broth for soups and mini pumpkin pot pies! One great thing about these pumpkin pot pies is that they can be made in steps. Maybe you have ten minutes in the morning to prepare the crust, if you didn’t buy one ahead of time. Then another ten minutes during nap time to prepare the filling. At dinner time all you have to do is put dinner in the oven! 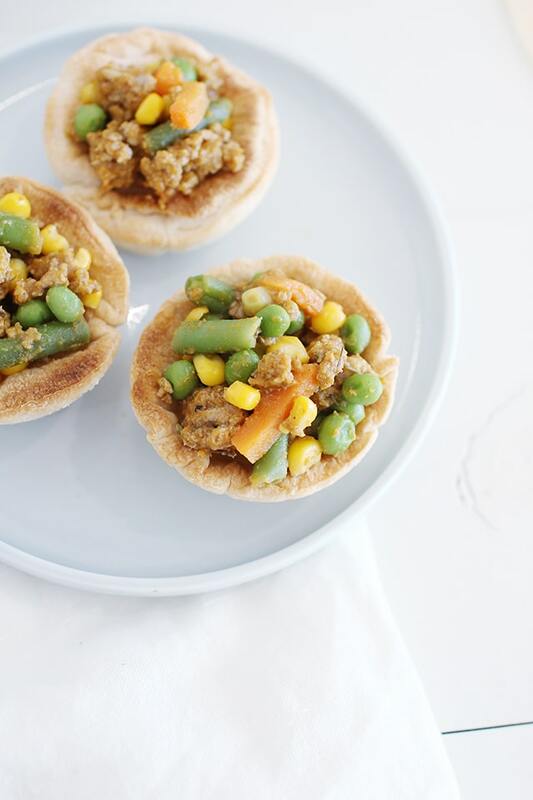 Mini pumpkin pot pies make great finger food for kids. If your kids are like mine they will take any chance they can get to eat with their hands. The pies can be packed in lunches and eaten warm or cold. You can even make a big batch and freeze them for easy lunches later. Make the pot pies in advance and then serve them with a simple strawberry apple salad for a quick Saturday lunch. Are your holiday guests still in town? Serve mini pumpkin pot pies for brunch. They even make a delicious savory breakfast! Do you have a family like mine with a variety of food allergies? Adjust the recipe to meet everyone’s needs and color code the muffin cups so you know who gets what. That is a lifesaver for me so I don’t give someone the wrong food by mistake. Not interested in making pie? No problem. The filling makes a great pasta sauce! Cook some noodles and stir in the pot pie filling. You can also serve it over rice. Maybe you want to skip the starch all together. Simply add extra broth to the filling for delicious pumpkin turkey soup. There are so many ways to enjoy Thanksgiving leftovers. 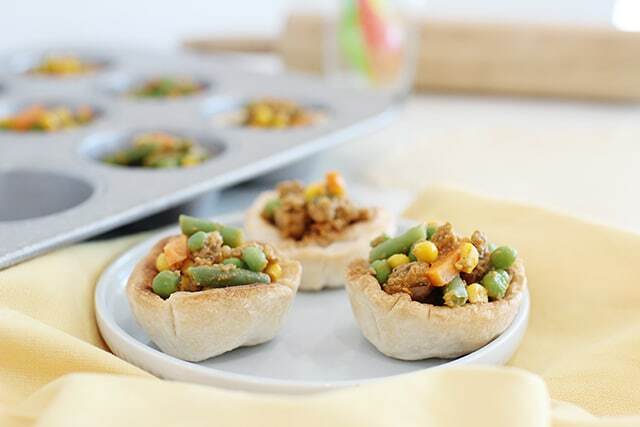 Add these muffin tin mini pumpkin pot pies to your menu for variety and fun. Join our mailing list to receive the latest news and updates from our site. Do you need help to lose weight? Join now for free so that we can help you start losing weight now!